Phoenix, AZ – February 1, 2017 – ABI Multifamily, the Western US's leading multifamily brokerage and advisory services firm, is pleased to announce the $22,650,000 / $128,693 Per Unit sale of the Town Center Apartments, a Class "A" garden style apartment community, located in Queen Creek, Arizona. Situated in the heart of Queen Creek, Town Center is a two and three story garden style community which rests on 10.52 acres of land and was completed in 2009. Built of a combination of wood and block construction, the property features an attractive mix of 40 -1 bed, 112- 2 bed and 24- 3 bed units that range in size from 750 -1,272 square feet. Unit interiors feature custom cabinetry in kitchen, bath and laundry, granite kitchen counter tops, hardwood style flooring and full size in-home washers and dryers. Additional property features include: a fully furnished clubhouse with wet bar, 24-hour fitness center, heated pool and spa, as well as, shaded children's play areas. "The Buyer purchased this property for a host of reasons," states Eddie Chang, Partner at ABI and co-lead broker with Rue Bax, Senior Managing Partner, representing the Buyer in this transaction. "First, there's extremely limited inventory in Queen Creek, in fact, there's only one competing project and one currently in the planning phases. Second, the area has witnessed an explosion in population rising over 30% since 2010 alone and among the fastest growing cities in the US. Given these strong fundamentals, the Buyer jumped at the opportunity to own a Class ‘A' asset with value add upside in a rapidly growing area." The Buyer, Laguna Point Properties, LLC, is an experienced private multifamily investment company based in California. 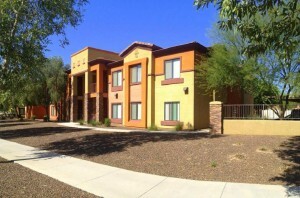 The Seller, K and M Development #1, LLC, is an experienced multifamily investment partnership based in Arizona. The Phoenix based ABI Multifamily brokerage team of Rue Bax, Eddie Chang, John Kobierowski, Alon Shnitzer, and Doug Lazovick represented the Buyer in this transaction.